Last week was one of the big tech events of the year the CES. More Cureved OLED’s, all types of drones and robots, wearable devices, 3D printing and virtual reality with Oculus Rift. As always a lot of new hype and trends are thrown at us, but what is really to watch out for and keep in mind for the next year. Inside you will find 3 trends you will already experience this year. Last year we saw the first models showing up, but 2014 will be the year that 4K TV’s will actually be affordable. This being said content will still be limited since the new optical disk/blue ray standard will not be ready until the end of the year. This however created a big unexpected winner at the CES: Netflix. Netflix will offer 4k content and is embraced completely by the TV set producers at CES. This will mean almost all new ‘smart’ TV sets will come included with Netflix as a system seller. This will create an even better position for Netflix as the first true internet/streaming TV channel. To start off the show Nvidea showed off their new Tegra Chip, the Tegra k1. 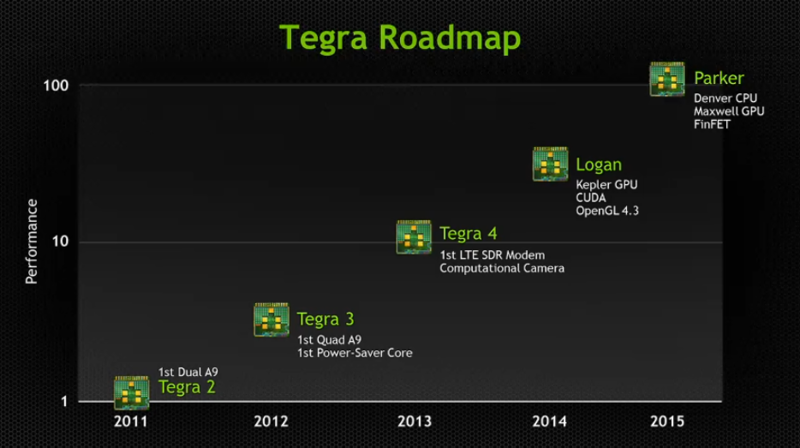 From the road map of Nvidea it has been known for years that this faster chip was coming, but the Tegra K1 really helps to put in prospective how fast mobile processors are developing. The main reason that it speaks so much to my imagination is that this Tegra k1 chip has about the same power as the current gen consoles, so you can expect the same quality and power these machines have been giving only than on your mobile. Sony bought Gaikai back in 2012 to start work on to streaming gaming at this CES Sony showed this technology for the first time. What it basically will do is stream any PS3 game over the internet to a certified Playstation device. The service is set to launch this summer on PlayStation 3/4 and Vita. As for mobile devices and Bravia support, that’s expected by year’s end. Posted in Gadgets, Technology, Uncategorized and tagged 4k, CES, CEs 2014, Other app-enabled devices, sony, tegra, uhd.